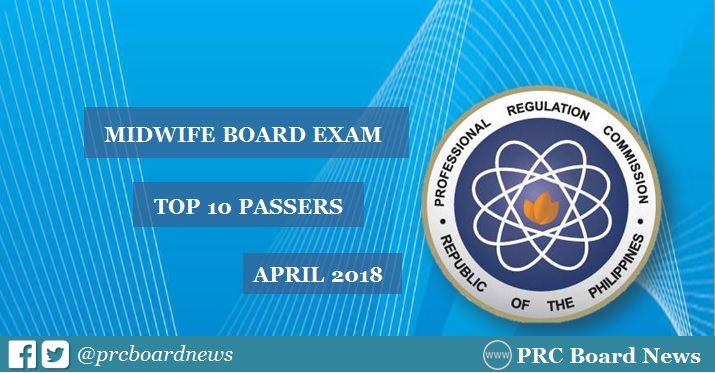 MANILA, Philippines - The April 2018 Midwife board exam top 10 or topnotchers including other results - list of passers, top performing schools and performance of schools are released online on Tuesday, April 17 or in three (3) working days after the exam. Dennis Michael Esteban Zequerra from Cotabato Medical Foundation College aced the board with 91.75%. Ethel Cubilan Valones from University of the Philippines School of Health and Sciences - Leyte ranked second with 90.95%. The Professional Regulation Commission (PRC) administered the licensure exam on April 11 and 12 in the cities of Manila, Baguio, Cagayan de Oro, Cebu, Davao, Iloilo, Legaspi, Pagadian, Tacloban, Tuguegarao and Zamboanga. In the April 2017 examination, Kathryn Avery Antonio Aldave from Catanduanes State University (CSU) - Virac aced the board with 91.45%. It was followed by Donna Mae Bragais Imperial from Bicol University (BU) - Tabaco with 90.80%. Meanwhile, Marilou Jumalon Montefalcon from Christ The King College- Gingoog City got the highest place in the April 2016 midwives board exam, 90.50%. Mary Reciel Denice Sinforoso Bernarte, also from BU-Tabaco, placed second with 90.00%. When you are so much concerned about you midlife and then this result come out. You may check here www.personalstatementexample.net/pharmacy-school-personal-statement-sample for the personal statement sample on pharmacy. it is celebration time for those top 10 students in here as the result is out. In here www.getting-into-mba.com/top-marketing-mba-programs/ you get the applications for the harvard mba. You may be surprised because of the short list but they are lethal . This page www.lowgpa.net/graduate-schools-that-accept-low-gpa/ will give you option for your low gpa. You said it graciously that engaging books are in like manner extraordinary and perfect to satisfy the understudies and issue free. When they feel depleting and don't value examining visit this link diverse books they can scrutinize intriguing books for some delight. No doubt, banks are huge for parentless understudies if financiers give them the office of getting cash. Investors can you can find out more offer cash to parentless understudies on portion returning which will change the entire world very soon.